About 6 months ago I had a chance to work with the Canadian Parks and Recreation Association (CPRA) on a project called "Canada Gets Active". It's an initiative across Canada that supplies Grade 5 students with a Community Activity Pass that provides them with FREE access to designated recreation facilities. It was a great project to work on, and is a great effort by the CPRA. I created a poster design, logo, characters, as well as the actual passes for the kids to use. Here's a look at the sketch of the characters from the poster design. The characters we created for the project were based on sports equipment so as to avoid race and gender. Hopefully I can show more soon. 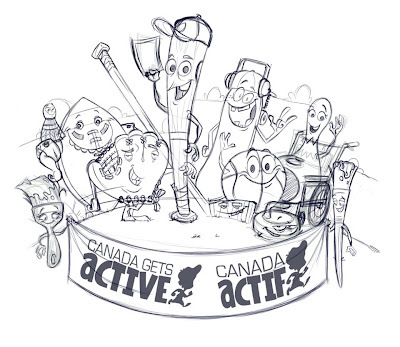 Read more about "Canada gets Active" here! Great Characters Ben, very expressive. Great stuff man, looks fantastic! I want more!! I remember this one:) Very nicely done! I do however find it very discriminating, that there's no tennis rackets represented in this image!!! as much as you can try to avoid race, we all know the bowling pin is gonna be white. ahhhh i love your characters!